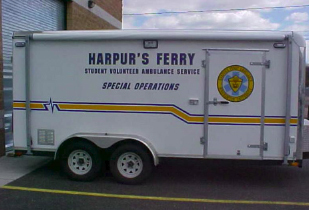 Harpur’s Ferry utilizes a John Deere Gator with a med bed for all terrain patient extrication, and a Special Operations trailer to mobilize the gator and MCI equipment. The Trailer is also used as a mobile command post for prolonged incidents and special events. 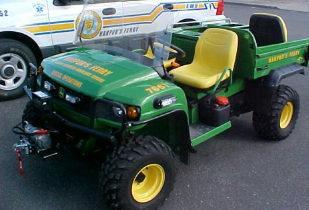 7661 is a John Deere Gator equipped with a med-bed modification. This vehicle can extricate patients while they are under the care of an EMT or Medic in order to safely and quickly move them to an ambulance for transport. 7661 is equipped with BLS equipment. The Special Operations Trailer deploys with one of our flycars for prolonged incidents, mass casualty incidents, and special events. 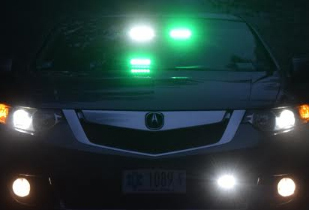 EMTs can operate green courtesy lights in their vehicles for off duty response. AEMT-CCs and Paramedics can operate red lights and sirens if their vehicles are certified by NYS DOH as EASVs.